For the city district of Tashkent, Uzbekistan, see Mirzo Ulugbek. For the town, see Ulugbek (town). Ulugh Beg was notable for his work in astronomy-related mathematics, such as trigonometry and spherical geometry, as well as his general interests in the arts and intellectual activities. It is thought that he spoke five languages: Arabic, Persian, Turkic, Mongolian, and a small amount of Chinese. During his rule (first as a governor, then outright) the Timurid Empire achieved its cultural peak through Ulugh Beg's attention and patronage. Samarkand, which was captured and given to Ulugh Beg by his father Shah Rukh, became the headquarters of Muslim culture. He built the great Ulugh Beg Observatory in Samarkand between 1424 and 1429. It was considered by scholars to have been one of the finest observatories in the Islamic world at the time and the largest in Central Asia. Ulugh Beg was subsequently recognized as the most important observational astronomer from the 15th century by many scholars. He also built the Ulugh Beg Madrasah (1417–1420) in Samarkand and Bukhara, transforming the cities into cultural centers of learning in Central Asia. However, Ulugh Beg's scientific expertise was not matched by his skills in governance. During his short reign, he failed to establish his power and authority. As a result, other rulers, including his family, took advantage of his lack of control and he was subsequently overthrown and assassinated. 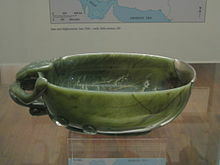 Jade dragon cup that once belonged to Ulugh Beg, 1420-1449 AD, British Museum. He was a grandson of the great conqueror, Timur (Tamerlane) (1336–1405), and the oldest son of Shah Rukh, both of whom came from the Turkicized Barlas tribe of Transoxiana (now Uzbekistan). His mother was a noblewoman named Goharshad, daughter of a member of the representative Turkic tribal aristocracy, Ghiyasuddin Tarkhan. Ulugh Beg was born in Sultaniyeh in Persia during Timur's invasion. His was given the name Mīrzā Muhammad Tāraghay. Ulugh Beg, the name he most commonly known by, was not truly a personal name, but rather a moniker, which can be loosely translated as "Great Ruler" (compare modern Turkish ulu, "great", and bey, "chief") and is the Turkic equivalent of Timur's Perso-Arabic title Amīr-e Kabīr. As a child he wandered through a substantial part of the Middle East and India as his grandfather expanded his conquests in those areas. After Timur's death, Shah Rukh moved the empire's capital to Herat (in modern Afghanistan). Sixteen-year-old Ulugh Beg subsequently became the governor of the former capital of Samarkand in 1409. In 1411, he was named the sovereign ruler of the whole of Mavarannahr. The teenaged ruler set out to turn the city into an intellectual center for the empire. 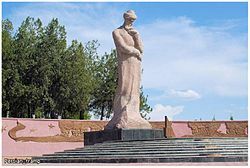 Between 1417 and 1420, he built a madrasa ("university" or "institute") on Registan Square in Samarkand (currently in Uzbekistan), and he invited numerous Islamic astronomers and mathematicians to study there. The madrasa building still survives. Ulugh Beg's most famous pupil in astronomy was Ali Qushchi (died in 1474). Qadi Zada al-Rumi was the most notable teacher at Ulugh Beg's madrasa and Jamshid al-Kashi, an astronomer, later came to join the staff. He was also famous in the fields of medicine and poetry. He used to debate with other poets about contemporary social issues. He liked to debate in a poetic style, called "Bahribayt" among local poets. According to the Russian medical book "Mashkovskiy", Ulugh Beg discovered a mixture of alcohol with garlic, apparently preserving it to help treat conditions like diarrhea, headache, stomach ache and intestine illnesses. He also offered advice for newly married couples, which indicate recipes containing nuts, dried apricot, dried grape etc. He claimed these to be useful to increase men's virility. This recipe has been given in Ibn Sina's books also. From an early age, astronomy piqued his interest after he paid a visit to what was still present of the Maragheh Observatory located in Maragheh, Iran. This is the observatory where the well-known astronomer Nasir al-Din al-Tusi practiced. In 1428, Ulugh Beg built an enormous observatory, called the Gurkhani Zij, similar to Tycho Brahe's later Uraniborg as well as Taqi al-Din's observatory in Constantinople. Lacking telescopes to work with, he increased his accuracy by increasing the length of his sextant; the so-called Fakhri sextant had a radius of about 36 meters (118 feet) and the optical separability of 180" (seconds of arc). The Fakhri sextant was the largest instrument at the observatory in Samarkand (an image of the sextant is on the side of this article). There were many other astronomical instruments located at the observatory, but the Fakhri sextant is the most well-known instrument there. The purpose of the Fakhri sextant was to measure the transit altitudes of the stars. This was a measurement of the maximum altitude above the horizon of the stars. It was only possible to use this device to measure the decline of natural objects in space. The image, which can be found in this article, shows the remaining portion of the instrument, which consists of the underground, lower portion of the instrument that was not destroyed. The observatory built by Ulugh Beg was the most pervasive and well-known observatory throughout the Islamic world. With the instruments located in the observatory in Samarkand, Ulugh Beg composed a star catalogue consisting of 1018 stars, which is eleven less stars than are present in the star catalogue of Ptolemy. Ulugh Beg utilized dimensions from al-Sufi and based his star catalogue on a new analysis that was autonomous from the data used by Ptolemy. Throughout his life as an astronomer, Ulugh Beg came to realize that there were multiple mistakes in the work and subsequent data of Ptolemy that had been in use for many years. Using it, he compiled the 1437 Zij-i-Sultani of 994 stars, generally considered[who?] the greatest star catalogue between those of Ptolemy and Brahe, a work that stands alongside Abd al-Rahman al-Sufi's Book of Fixed Stars. The serious errors which he found in previous Arabian star catalogues (many of which had simply updated Ptolemy's work, adding the effect of precession to the longitudes) induced him to redetermine the positions of 992 fixed stars, to which he added 27 stars from Abd al-Rahman al-Sufi's catalogue Book of Fixed Stars from the year 964, which were too far south for observation from Samarkand. This catalogue, one of the most original of the Middle Ages, was first edited by Thomas Hyde at Oxford in 1665 under the title Tabulae longitudinis et latitudinis stellarum fixarum ex observatione Ulugbeighi and reprinted in 1767 by G. Sharpe. More recent editions are those by Francis Baily in 1843 in vol. xiii of the Memoirs of the Royal Astronomical Society and by Edward Ball Knobel in Ulugh Beg's Catalogue of Stars, Revised from all Persian Manuscripts Existing in Great Britain, with a Vocabulary of Persian and Arabic Words (1917). In 1437, Ulugh Beg determined the length of the sidereal year as 365.2570370...d = 365d 6h 10m 8s (an error of +58 seconds). In his measurements over the course of many years he used a 50 m high gnomon. This value was improved by 28 seconds in 1525 by Nicolaus Copernicus, who appealed to the estimation of Thabit ibn Qurra (826–901), which had an error of +2 seconds. However, Ulugh Beg later measured another more precise value of tropical year as 365d 5h 49m 15s, which has an error of +25 seconds, making it more accurate than Copernicus's estimate which had an error of +30 seconds. Ulugh Beg also determined the Earth's axial tilt as 23°30'17" in the sexagesimal system of degrees, minutes and seconds of arc, which in decimal notation converts to 23.5047 degrees. In mathematics, Ulugh Beg wrote accurate trigonometric tables of sine and tangent values correct to at least eight decimal places. In 1447, upon learning of the death of his father Shah Rukh, Ulugh Beg went to Balkh. Here, he heard that Ala-ud-Daulah Mirza, the son of his late brother Baysonqor, had claimed the rulership of the Timurid Empire in Herat. Consequently, Ulugh Beg marched against Ala-ud-Daulah and met him in battle at Murghab. He defeated his nephew and advanced toward Herat, massacring its people in 1448. However, Abul-Qasim Babur Mirza, Ala-ud-Daulah's brother, came to the latter's aid and defeated Ulugh Beg. Ulugh Beg retreated to Balkh, where he found that its governor, his oldest son Abdal-Latif Mirza, had rebelled against him. Another civil war ensued. Abdal-Latif recruited troops to meet his father's army on the banks of the Amu Darya river. However, Ulugh Beg was forced to retreat to Samarkand before any fighting took place, having heard news of turmoil in the city. Abdal-Latif soon reached Samarkand and Ulugh Beg involuntarily surrendered to his son. Abd-al-Latif released his father from custody, allowing him to make pilgrimage to Mecca. However he ensured Ulugh Beg never reached his destination, having him, as well as his brother Abdal-Aziz assassinated in 1449. Eventually, Ulugh Beg's reputation was rehabilitated by his nephew, Abdallah Mirza (1450–1451), who placed his remains in the mausoleum of Timur in Samarkand, where they were found by Soviet archeologists in 1941. Ulugh Beg Observatory in Samarkand. In Ulugh Beg's time, these walls were lined with polished marble. Ulugh Beg and his astronomical observatory scheme, depicted on the 1987 USSR stamp. He was one of Islam's greatest astronomers during the Middle Ages. The stamp says "Uzbek astronomer and mathematician Ulugbek" in Russian. The crater, Ulugh Beigh, on the Moon, was named after him by the German astronomer Johann Heinrich von Mädler on his 1830 map of the Moon. 2439 Ulugbek, a main-belt asteroid which was discovered on 21 August 1977 by N. Chernykh at Nauchnyj, was named after him. Soviet anthropologist Mikhail M. Gerasimov reconstructed the face of Ulugh Beg. Like his grandfather Timurlane, Ulugh Beg is close to the Mongoloid type with slightly Europoid features. His father Shah Rukh, had predominantly Caucasoid features, with no obvious Mongoloid feature. ^ a b c "Samarkand: Ulugh Beg's Observatory". Depts.washington.edu. ^ a b "The Legacy of Ulugh Beg | Central Asian Monuments | Edited by H. B. Paksoy | CARRIE Books". Vlib.iue.it. Retrieved December 2, 2018. ^ "Ulugh Beg". The University of Oklahoma Libraries. Britannica Academic. ^ "cup". British Museum. Retrieved January 5, 2019. ^ В.В. Бартольд. Улугбек и его время. – Petrograd, 1918 - p. 37. ^ "Улугбек - Биография". Opklare.ru. Retrieved January 5, 2019. ^ a b c "The Legacy of Ulugh Beg | Central Asian Monuments | Edited by H. B. Paksoy | CARRIE Books". Vlib.iue.it. ^ "The Star Catalogues of Ptolemaios and Ulugh Beg" (PDF). Astronomy & Astrophysics. ^ L.P.E.A. Sédillot, Prolégomènes des tables astronomiques d'OlougBeg: Traduction et commentaire (Paris: Firmin Didot Frères, 1853), pp. 87 & 253. ^ "ʿABD-AL-LAṬĪF MĪRZĀ – Encyclopaedia Iranica". Iranicaonline.org. ^ The history of Persia. Containing, the lives and memorable actions of its kings from the first erecting of that monarchy to this time; an exact Description of all its Dominions; a curious Account of India, China, Tartary, Kermon, Arabia, Nixabur, and the Islands of Ceylon and Timor; as also of all Cities occasionally mention'd, as Schiras, Samarkand, Bokara, &c. Manners and Customs of those People, Persian Worshippers of Fire; Plants, Beasts, Product, and Trade. With many instructive and pleasant digressions, being remarkable Stories or Passages, occasionally occurring, as Strange Burials; Burning of the Dead; Liquors of several Countries; Hunting; Fishing; Practice of Physick; famous Physicians in the East; Actions of Tamerlan, &c. To which is added, an abridgment of the lives of the kings of Harmuz, or Ormuz. The Persian history written in Arabick, by Mirkond, a famous Eastern Author that of Ormuz, by Torunxa, King of that Island, both of them translated into Spanish, by Antony Teixeira, who liv'd several Years in Persia and India; and now render'd into English. ^ Frye, Richard Nelson (January 5, 2019). "Greater Iran: A 20th-century Odyssey". Mazda. Retrieved January 5, 2019 – via Google Books. ^ Gerasimov, Mikhail Mikhaĭlovich (January 5, 1971). "Ich suchte Gesichter". J. B. Lippincott. Retrieved January 5, 2019 – via Google Books. O'Connor, John J.; Robertson, Edmund F., "Ulugh Beg", MacTutor History of Mathematics archive, University of St Andrews . Wikisource has the text of the 1911 Encyclopædia Britannica article Ulugh Beg. Wikimedia Commons has media related to Ulugh Beg. Chisholm, Hugh, ed. (1911). "Ulugh Beg" . Encyclopædia Britannica (11th ed.). Cambridge University Press.